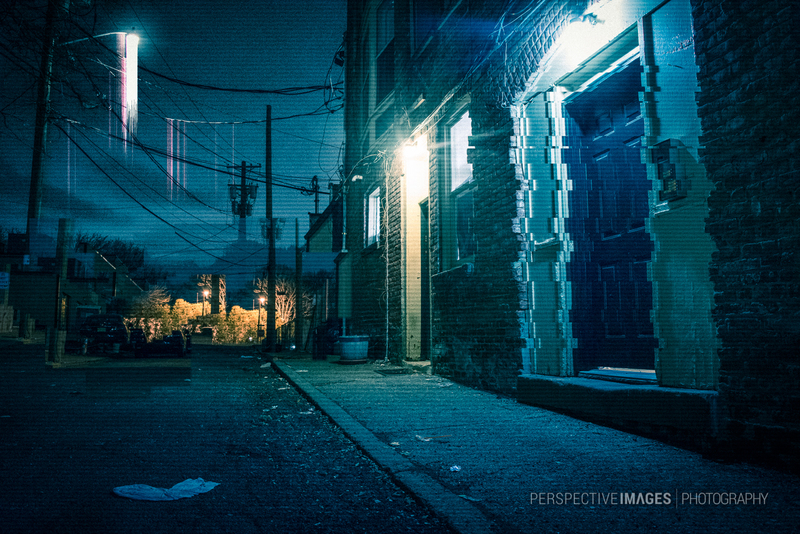 I headed out before the storm started last night to shoot this side street. The building has fascinated me for a long time. Power and phone cables drape from above the door ways, contrasting against the aged texture of the brick work. Without the glitch art treatment, the result of the shoot was favorable, however my goal was to create a sense of unease. Not an obvious distress, but a nagging annoyance, like an itch on the top of your mouth. By adding elements of digital decay, I brought emphasis to what is at the end of street, the position the viewer’s eyes are lead. The glitch is not pronounced, something is slightly off, something is not quite right. Thanks Sherri! They do look like icicles don’t they? They’re actually a bit of photoshop work simulating light tears. trade secrets and all that. keeps the mystery alive as well. There is definitely something “strange” about this, Will. HA! The strange things happening the world… right now it’s strange that it is UNSAFE to walk the streets at night… be safe ok? Another thing that’s strange: I never felt like it was a problem to walk around with a tripod. Now I’m worried someone will mistake it for a gun. Sad times indeed. I actually quite like the background a lot. That looks like a very lovely town. I would love to explore Notts more, sadly I think I have only been to Nottingham. You’re right, it does have surreal, Twin Peaks vibe. That is fabulous. I light the way you created that light dripping down.